3/32” shank tapered split mandrel for sanding. Also holds large sanding cones. 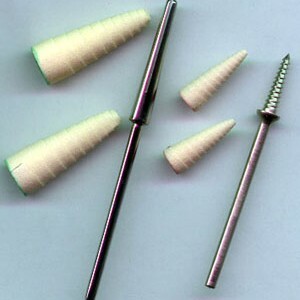 Precision tapered split mandrel specially made for large sized sanding cones, but will also work as a standard split mandrel. 3/32″ shank. Package of 10. Fine 350 grit (green) small-sized sanding cones. Use with #M100, EBM8 or #M7 mandrels (sold separately). 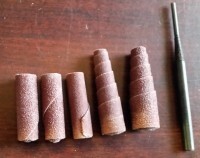 You will wonder how you ever did without these handy miniature sanding mandrels and cones. They are quick, convenient, and economical. Best of all, they do an incredible job of fine sanding and blending in those hard-to reach areas that all wildlife carvers encounter all the time. Available in two sizes and two grits in each size. They are all quick and easy to change, and the wrapped-paper design exposes new grit as the cones wear down. 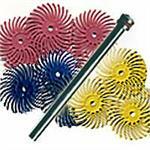 We recommend using them at lower speeds, under 10,000 RPM, for longer life and more control. Package of 10. Fine 300 grit (green) regular-sized sanding cones. Use with #M20 or M22 mandrels (sold separately). Package of 10. Medium 250 grit (red) small-sized sanding cones. Use with #M100, EMB8 or #M7 mandrels (sold separately). Package of 10. Medium 200 grit (red) regular-sized sanding cones. Use with #M20 or M22 mandrels (sold separately). Package of 10. 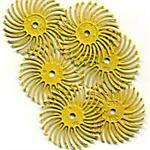 Fine 150 grit (Yellow) regular-sized sanding cones. Use with #M20 or M22 mandrels (sold separately).